With over a thousand sporting events to choose from daily, you are sure to find the game you are looking for on BetWinner. Owned and operated by Marikit Holdings Ltd., BetWinner was established in 2018. The Curacao-licensed platform is offered in 51 languages. It also has several country restrictions such as Iran, the Netherlands, the US, France, Italy, the UK, and the United States Minor Outlying Islands. BetWinner is easy to access as you can do it through using desktop, mobile devices, or its mobile app. You can get in touch with the bookie through the site’s customer service via 24/7 live chat, e-mail, and phone support. Continue reading this review to know more about the bookmaker. 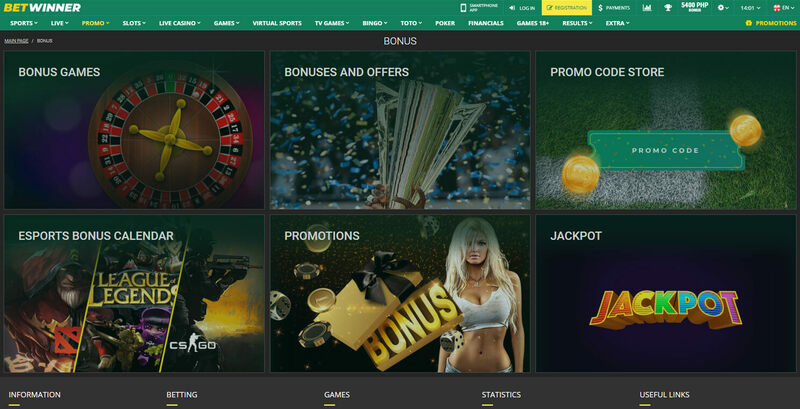 Upon registering with BetWinner, you are automatically entitled to a 100% bonus up to €80 on your first deposit. The minimum amount you can top up your account is €0.80. You have to roll over the bonus amount five times in accumulator bets in which the accumulators should contain at least three events each and have at least 1.40 odds. The sportsbook picks popular sporting events that it thinks will gain the most profit for its bettors. Then, the betting site combines the sporting events into Sports and Live Accumulators. With over 1,000 events to choose from, you can select tons of Accumulator of the Day options. If your desired accumulator wins, you will get a 10% increase on your odds. With this promotion, you can fully or partially insure your bets. Insurance can be applied to only single and accumulator bets. There is a fee of €5 that will be deducted to your account if you chose to insure your bets. For example, you placed a €10 wager, and you would like to insure 100% of your bet. The bookie will charge you €5 as an insurance fee. If your bet wins, you get your rewards in full. However, if your bet loses, you get your €10 back because you had your bet 100% insured. This promotion is like borrowing money from the sportsbook. When you do not have enough money in your account to place an additional bet on an outcome, BetWinner offers you extra funds up to 10 times your account balance. The betting site also offers deals such as a 25% Deposit Bonus, Birthday Bonus, Promo Codes, and a 100% Deposit Bonus every Thursday. Casino offers are available as well in which you can win free spins, promo points, and even gadgets. There are 46 sports available on the betting hub including football, tennis, basketball, ice hockey, and volleyball, to name a few. 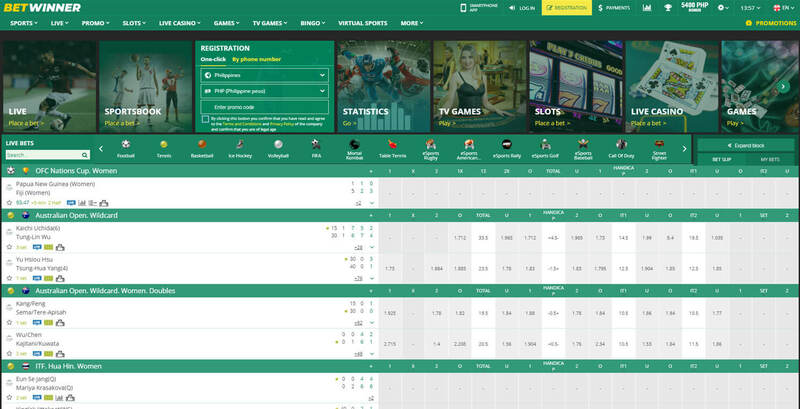 Under the Sports section, you will see pages like Match of the Day, Bet on Your National Team, Bet on Big Tournaments, Bet Constructor, and Betting Exchange. In Match of the Day, a certain game is chosen in which you have to bet on what the correct score or game turnout will be. Bet on Your National Team presents odds for games which involves your national team. Bet on Big Tournaments is pretty straightforward as odds of big tournaments such as the UEFA Champions League and Euroleague are seen under this page. The bookie also has the Bet Constructor feature wherein you can customize your own bets by combining different markets and events. The Betting Exchange feature, on the other hand, allows you to bet against other members of the site by indicating your own odds for an event. The site has a Live section that lets you wager on live sports games. You can also watch up to four HD live-streamed events simultaneously. In this betting hub, you can bet in many different ways as the betting type selections are broad. The site provides options such as European handicap, run of play, over/under, chain bets, accumulators, and singles. Other than being just a sportsbook, BetWinner is a casino. The site has sections on Slots, Games, TV Games, Bingo, and Live Casino, among others. The games on-site are of high-quality as these come from top-notch providers like Wazdan, Play’n GO, and Betsoft. 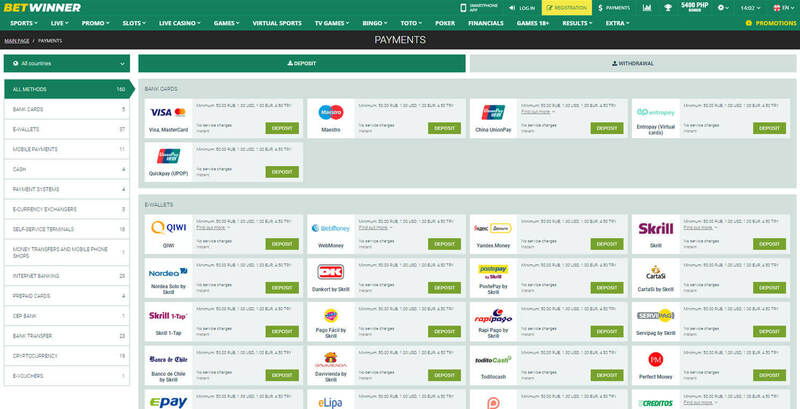 The online bookie offers tons of options when it comes to payments as the currencies provided accommodate both fiat and crypto. You can pay in EUR, USD, RUB, BTC, and DOGE, among others. There are 160 ways for you to make a deposit. Your deposits are processed instantly, whether it is made in fiat or crypto. The lowest amount you can load up your account with is €0.60. The sportsbook does not indicate the maximum deposit limit amount. There are 102 ways for you to withdraw your funds. The minimum amount for withdrawals is €1.35. The sportsbook does not indicate the maximum withdrawal limit amount. The process for withdrawals can take between a minute and seven days for fiat transactions. For crypto, on the other hand, withdrawal transactions can take up to a maximum of fifteen minutes. The betting site recommends using the same withdrawal methods as your deposit methods to avoid complications and ensure a smooth sailing transaction. BetWinner: Is It Worth It? BetWinner is a bookie that is easily recommendable as it has a lot of great features such as the multi-live streaming, tons of casino and sportsbook bonuses, plenty of betting types, and over a thousand of sporting events daily. The site also has few country restrictions which makes it open to a lot of jurisdictions. The extensive language, currency, and payment options give the site a welcoming feel as if anybody can register with the bookie. The betting hub is available as a mobile app as well which makes it convenient to access anywhere. Payment methods do not lack in this site as there are about 160 ways for you to transact. The currencies are extensive as well for it caters more than 200 options in both fiat and in crypto. Overall, BetWinner is a bookie that you should definitely check out and register with as you would not want to miss out on the great features this site has to offer.